"She's the perfect woman, right? Incorruptible - god I love that!" 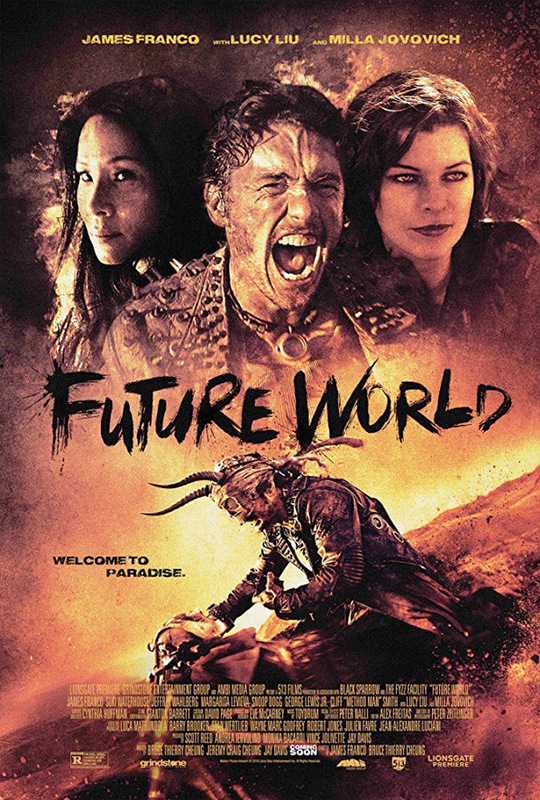 Lionsgate has released another official trailer for the film Future World, a post-apocalyptic, sci-fi action western. We featured another trailer for this last week, but was pulled off the web. Now we have this one and it doesn't look any better. Still looks like a straight-up rip-off of Mad Max, with sand motorcycles, grungy cars and everything. The story involves some kind of boy searching for a rumored cure for his dying mother, but is actually about a robot woman? I don't really know. James Franco co-directs, and stars along with Milla Jovovich, Lucy Liu, Margarita Levieva, Suki Waterhouse, Method Man, Snoop Dogg, Elisha Henig, and Scott Haze. So I'm only posting this just to add it here, but don't really care to ever watch this. Don't have time to waste on this junk.